I think I may be dreaming! Pinch me I may be dreaming! There is a new digital only magazine that will be published monthly in the Newsstand on the iPad. AND>>>>> I was fortunate enough to be asked to be their Blogger Spotlight for this month. I know… can you believe it??? I can’t!! a bio about myself along with some of my latest work. Of course it took me a millisecond to say YES! Die Cut Crazy is a digital only magazine created for those who have been bitten by the die cutting bug. Explore the many mediums, not just paper, that you can create with using your die cut machine and die cut products. Look inside and find out what is making everyone Die Cut Crazy! The 1st edition is available now HERE in the iTunes store. You will find my article below…. The editor-Stephanie said I could share it with all of you! She is super, super sweet! Also, they are looking for other featured bloggers and the contact email info is at the bottom of my article! Thanks for being so supportive over the years and I so appreciate you letting me share my news with you! Have a blessed day….I know I will! 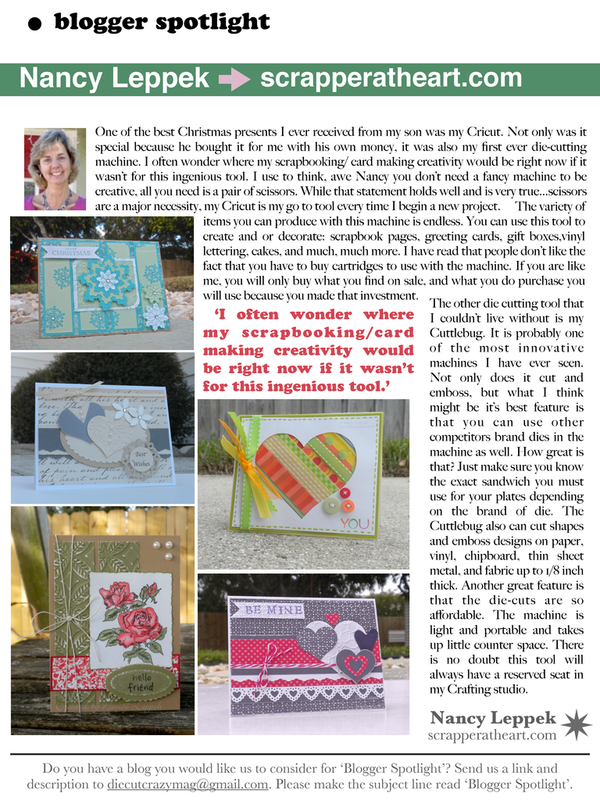 Categories: Other | Tags: Cricut, cuttebug, Digital magazine, ipad | Permalink. Congratulations! That is great that your work is featured. And your artwork is fantastic!. So proud! Thanks again for your help this weekend. You are the best! Congratulations, Nancy! That must have been so thrilling, still is, I imagine! !